The period since our last newsletter has seen the completion of a number of major works funded by the section 106 money from the development on the Marconi site, now Bentley Grove. First, in the last newsletter I reported that a new dam had been constructed at Pynding Mersc in Stanmore Common, both safeguarding that area of woodland wetland and improving the horse ride at that point. Soon afterwards a long boardwalk was created across the Mersc. This is a lot of fun to walk over, and should give children a lot of opportunities for pond dipping come the Spring. It also means that pedestrians do not need to join the horse ride to access Bluebell Heath, and indeed we have blocked the connection between Druids Walk and the horse ride. Since we had already built fences and gates at two other exit points from the horse ride I hope that the problem of horse riders on the pedestrian paths will be markedly reduced. Second, the cattle proof fence around Forty Acre Field on Stanmore Country Park has been repaired and strengthened, and a new gate installed at the corner adjoining Kerry Avenue. The aim is to put cattle on the site: the cattle on Bentley Priory have been critical in maintaining the species-rich grassland and therefore the SSSI status of that site, so having cattle on Stanmore Country Park would improve both the appearance and the biodiversity. They will not appear this summer – David Corby needs to puzzle out how to reconnect the water supply to the water trough, but once that is done, it is only a matter of finding a farmer willing to put cattle on the site. The third item is not a physical change but is nevertheless very welcome: John Dobson has created a thorough and academically rigorous botanical survey of Stanmore Common, which as well as being interesting in itself will be a vital guide to our ongoing management of the site. To download the survey click here. While we can be grateful that these works are completed this does, I suspect, pretty much use up that pot of Section 106 money. However we can be very grateful to Councillor Keith Ferry, Council landscape architect Sally Reeves, and the biodiversity officer Denis Vickers for putting together a proposal for a Green Grid (click here). This is essentially a list of projects, including new footpaths, wetland improvements and tree planting schemes, that are listed as desirable albeit unfunded. By putting them down as Council aims it should be less possible for, for example, a development to block a potential link between existing open spaces without the Council planning department being aware of either the potential or the problem. Of particular interest to us is item 11.4.05 which reads “Land at Bentley Priory (The Common, Stanmore) Harrow £100K to assist in the provision of an ecology centre within the London Borough of Harrow - draft Planning Obligation.” Thus the ecology centre – perhaps at Bentley Priory, or perhaps elsewhere in the Borough – remains a Council aim, an aim which we strongly support. Since Denis Vickers has been such a great support to us in our work on our sites, and an important link between us and other Council officers, it is a relief to hear that Matthew Paterson, the Local Development Framework Team Leader at the Council, stated at a Greener Harrow meeting on the 16th of February 2011 that his post would continue. The most important volunteers on our sites are of course the wardens: it is because they know their sites so well, and take responsibility for them, that the sites remain the attractive nature havens that they are. Nevertheless volunteer groups who come for a morning or a day are very welcome, and there is always the hope that some of them may come back as regulars. This year the group of young people from Kol Chai Hatch End Jewish Community, who come regularly on Mitzvah day (this year 21st of November 2010) were joined by a larger and even more enthusiastic group from the Chinmaya Foundation, a Hindu group, on what they called Sewa day. Together they cleared a significant area of scrub on Bluebell Heath on Stanmore Common. Betty Brown reported that leaf clearing had continued to take place. Due to the lower number of volunteers currently involved with the site, the arrangements for the two annual events would be modified. The Open Day would be expanded and would continue to be composed of walks around the reserve and support for the Forum. The AGM would take a much simpler form. The path resurfacing was still outstanding and it was requested that the work be carried out. There was a wish to remember two different people by planting trees at the site. Peter Peretti has four English Walnuts trees available if required. 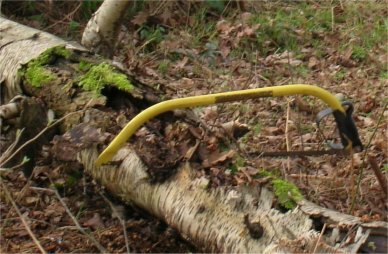 Dave Corby reported that he would have no money available for suitable trees but would have some small whips (0.5 – 1.00 m trees) available later in the year. Robert Stone said he would like to plant one of the Walnuts for a similar purpose. Steve Bolsover had received an email from Rev James Mercer and his concerns about a gate and that this was a priority spend for the Section 106 money. Peter Peretti had drafted a piece for the Friends of Bentley Priory Newsletter highlighting the importance of the woodlands, flora and wildlife. Peter said that was important that dogs were kept on leads in Spring Meadow for 3 months during the nesting season to limit disturbance and the issue of signage was also raised. Many surveys had been carried out over the years. The idea of holding a meeting on a particular site was discussed and this could be organised by the Harrow Natural History Society (HNHS) as their members had knowledge of various groups of flora and fauna.. The importance of passing on the information gathered was recognised by the HNHS. There were two BTCV visits during this period working mainly around Willow Pond. Birds seen on Summerhouse Lake in November included Goosander and the following ducks: Shoveler, Tufted, and Pochard. A Goosander had returned in January after the ‘big freeze’. Claire McDermott reported that there had been some positive developments. A team of volunteers had cleared the healing garden and an area had been opened up as a kick around football area so that the meadows were left alone. The site was looking much better already. The possibility of putting in novelty outdoor exercise bikes, if funding was available, to help to keep youngsters away from the toddler area was thought to be a good idea. Progress was being made towards the Shaw Trust taking over the Earth Project under a 35 year lease. Marin Verden would meet with Claire and the Shaw Trust, at an appropriate time, in connection with the Harrow Heritage shed and tools and their use. Progress was also being made with planning a Thistle clearance day and a children’s day archaeological dig connected with Victorian ceramic finds, maybe with the Museum of London. Lights with shades on the site had been recommended because local residents asked to have the path lit. Claire Abbott reported that this was a quiet time of year at the reserve. A request had been received from a local Scout group regarding Wide Games twice a year which would involve the woods. It was agreed that Claire would meet with them to ensure that the Scouts could enjoy the activities without causing major harm to the environment. The possibility of Scouts carrying out volunteer work was also discussed. The fence along Wood Lane needed repairs. Two BTCV visits were needed to deal with the Bracken. The local fishing club had carried out work around the pond. They had also dug holes in the wood to fill in holes in the track. Claire was talking to them about this as it was causing problems for the flora. Dave Bolton reported that following a meeting to discuss work on the site the pond had been identified as a priority while conditions were dry. Work on the pond had included the removal of 4 trees and digging out and using the soil to form a bank on the other side of the path. Holes in the grassland were being filled in and bricks taken out. The pond had taken a while to fill but was now overflowing. Some cutting had had to be carried out because it had been missed by the annual mowing. A walk had been organised for the Natural History Society and Dave Bolton was thanked for that. The repairs to the steps were still outstanding and Dave Corby reported that the schedule was very busy and that work on these could be carried out in bad weather. The condition of the Horse Chestnuts was discussed as they appeared to be suffering from Leaf Miner and Bleeding. Dave Corby agreed to ask someone to keep an eye on them. The drainage work carried out by the tracks appeared to have been successful as there had been no big flooding problems. Simon Braidman reported that work had continued in compartment 19 and in opening up compartment 20. Several BTCV working parties had taken place and more were planned. Steve Bolsover had worked with two groups of volunteers on 21st of November. Volunteers had been coming along for Mitzvah day for several years and the Hindu Community had also sent along volunteers. The detailed report on the Botany and Natural History of the site, completed by John Dobson, was now available and it was agreed that it would be put on the Forum’s website (link). Following the report, some suggestions regarding the renaming some compartments at the reserve, had already been incorporated. John Hollingdale reported that the stock proof fencing had been completed for the Lower 40 Acre field which was on the right when entering via the Kerry Avenue entrance. The fence was a higher quality than had originally been planned. Dave Corby reported that he would like to experiment with using rare breeds. This year would be used to ensure that water supply; locks etc were in place ready for the cattle to be introduced in May 2012. John has continued to carry out routine management on a regular basis. Together with the BTCV a section of overgrown Blackthorn had been cut back and Birch trunks (left by vandals) had been removed from the middle of Lower Forty Acre field. Paths have been opened up and invading birch and gorse removed from Upper Blue Pond. John reported that there had been some problems with the mowing this year and Dave Corby indicated that any general problems, across the sites, with mowing should not occur next year. John also reported that the balancing ponds were not being maintained. Steve Bolsover had had the reserve leaflets reprinted and he was thanked for that. Robert Stone reported that the clearing of Caesar’s Pond had been completed but the pond was not filling up. Dave Corby agreed to refer the matter to Mick Bradshaw in drainage. The problems of litter etc. at the Brewery Ponds were also discussed and it was agreed that Dave Corby and Robert Stone would talk to the police sergeant about the situation. The possibility of a fishing club was also discussed. The occurrence of coconuts in the ponds seemed to have been resolved but if the problem reoccurs appropriate further action would be taken.